★ EASY TO USE ★ With an advanced and intuitive file browser interface, Aerize Explorer can quickly and easily manage all of your files, folders, and storage cards with ease. Aerize Explorer employs an intuitive and easy to use Cut, Copy and Paste interface; this simplicity ensures Aerize Explorer is a powerful file manager. When you want to move a folder, simply tap and hold, then tap the Cut icon. Navigate to the destination and tap Paste. Simple. Easy. Powerful. 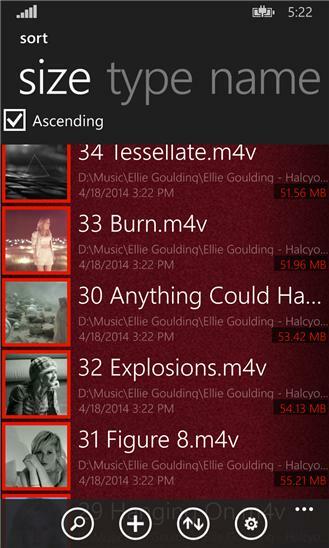 ★ POWERFUL ★ Aerize Explorer is the first file manager for Windows Phone that can read and write files and folders to storage cards and the device file system. Explore files and folders on your device or removable media card, search for video files, pictures files and music files. Recognizing common file types such as images, videos, music, and PDF files, this file explorer helps you to browse basic file information or launch files using the associated application. Start exploring the entire file system with Aerize Explorer today! ★ SHARING POSSIBILITIES ★ Open a whole new world of file sharing possibilities with Aerize Explorer. Bringing the innovative Share charm from Windows 8, sharing files and folders with other apps on the device has never been easier. Share files and folders to any application that accepts files as a sharing target. Want to tap and send to share a song with a friend? Simply tap share and select NFC. Maybe you want to share a PDF report with a coworker? Again, just tap share and chose an app. The possibilities are endless. Video to Facebook. Photo to twitter. Check. Notable Features: ★ Move files and folders between your device and media card ★ Share files with NFC, Bluetooth, Email, and much more ★ Cut, Copy, Paste, Delete and Rename files or folders ★ View file and folder properties ★ SELECTION MODE ★ Simply Tap+Hold a file or folder and Selection mode is engaged, presenting a context menu with all of the options you need for file management. Unique to the Aerzie Explorer implementation, the context menu is created out of the way, keeping all of the files on the screen the center of attention and unobstructed. Its easy to select one or more files to share, copy, move, open, pin and even delete directly from the folder interface. ★ MULTIPLE VIEWS ★ Added for user customization are compact, normal and large folder views. The compact view allows more items to display on the screen at a time, at the expense of some information and tile size. Only the tile, file name and size are shown. Normal view improves upon compact with a larger tile and file date, while showing less items on the screen at a time. The Large View has big tiles and the most information, being easier to see but has the least amount of items on the screen at a time. ★ THUMBNAIL PREVIEWS ★ Differentiate one photo from another with ease. While browsing the file system, whenever an image file is found, the picture from the actual image file will be displayed for the icon. Looking for the right image to share? Easy. Want to remove all of the blurry shots you just took? Simple. In connection with selection mode, Thumbnail preview is a powerful feature. After all, a picture is worth a thousand file names. ★ PIN FILES & FOLDERS ★ Pinning file and folders to the start screen interest you? Maybe you have a PDF file you would like to see instantly. Whatever the reason, the new version of Aerize Explorer has tiles for files and folders. 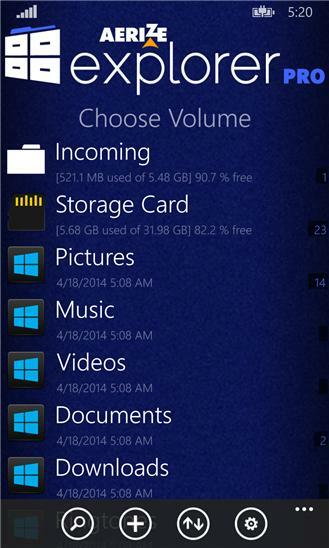 Simply select a file or folder and tap the Pin command and you will have a shortcut on the start screen!